Oprah has started a new series of shows on spirituality. One of the shows I had a chance to watch was going behind the scenes with “the secret” and other positive thinking authors. These teachers teach about the power of positive thinking to transform our lives and our reality. Jenn and I watched this and throughout the show, paused and reflected on a number of their teachings in light of what we understand as truth. Of course, we consider Scripture to be the truth revealed from God. Some of you may agree and find our notes interesting and helpful. Others may disagree, but I hope you can notice that the biblical truths do sounds much better, and there is good reason to prefer the biblical truths over the truths presented by positive thinkers. They talked about putting out our positive thoughts into the universe as if the universe was listening to our thoughts. As a result it can returned to you double what you put out. This sounds spiritual at first, and especially in the way they deliver it. They’ll tell you, give it a try and see if it works. This is their way of confirming it. If you put out positive thoughts about something and it eventually happens, then they must be describing reality truthfully and it must be real. One of the teachers said it also has to do with quantum physics and the mysterious forms of energy which we have power to control. This has huge problems in a universe made by an all powerful God. First of all, the universe was created by God and the only intelligence it exhibits and displays is the intelligent design that God gave it. The universe does not think on it’s own or interact with us in intelligent ways. There are certainly natural responses to our human behaviors, and global warming is definitely a large scale example of that. However, the universe does not have the power to orchestrate events and coordinate the actions of a multitude of people to satisfy our positive thoughts. Only God has the power to make such amazing calculations and coordinations of events to plan and foresee all possible alternative outcomes and insure that one predetermined outcome occurs. This is only in the hands of a supreme being who is able to perceive all things and effect all things in a single instance and in every place at any time. It is a mistake to attribute this power to the universe and fail to acknowledge God. If people do indeed experience blessings from their positive thoughts, it is only because of God’s common grace, that he gives to believers and unbelievers freely and graciously. God is gracious to us that we should recognize this grace and give proper recognition, respect and adoration to him. However, these positive thinkers give the credit, adoration and respect to themselves, attributing the power to be all from within them, and praising themselves for their positive thoughts. They teach positive thinking is a power that we can all harness to change our lives. This idea of using positive thinking completely ignores the ultimate authority and controller of the entire universe, God. It attempts to make us the people who are in control of our lives. We become the authority over what should happen in our lives. God no longer has his right place of authority to tell us what we should be doing. It also ignores the fact that bad things do happen to good people. For example, starving people in Africa continue to suffer. This is not because they have failed to think positive. On the hand, consider rich people do make lots of money. Greedy and evil people continue to exploit others and live in luxury with the money they make. Although they may think evil and negative continually, they still manage to make lots of money. The secret does not adequately address this reality. However, the Bible addresses this properly and explains why this all happens. Jesus is the perfect example of someone who was a man of hope, love and forgiveness, however, he did not live for the purpose of transforming his own life. He lived for God’s greater purpose and it was a plan that involved the salvation of our souls. The positive thinkers will teach you to make a vision board and put your visions there to make it a reality. I would challenge these positive thinkers to come up with the plan of salvation on their vision board! Who would ever dream of making a life like Jesus? Yet, there was no better life lived, than that of Jesus. And each one of us should not look to a vision board for guidance, but look to following Jesus and learning what God wants us to do. This is found in the Scriptures, not on a vision board. Positive thinkers recast everything as a means of benefit the self. What is it that you want for yourself? Even forgiveness is for the purpose of letting something go in order for the benefit of yourself. Their idea of forgiveness is meant to have a benefit for yourself rather than a benefit of the person being forgiven. This is not true forgiveness. True forgiveness is meant to benefit the person being forgiven. The person being forgiven no longer has the weight of their sin as a burden that causes separation in their relationship with the person who forgave them. Sure, when we forgive others, there is a benefit in that we avoid bitterness that can harden and bitter our hearts. But it is more importantly meant to restore the relationship with the person being forgiven so that we no longer count those sins against them. The ultimate act of forgiveness is the forgiveness of sins which Jesus earned by his death on the cross. Jesus went even one step further by not only earning forgiveness for us and but also bearing the penalty of our sins upon himself. And let’s be reminded that this was not any small penalty but it was the wrath of God against all the sins of those who he saves. Although many of us know that he suffered crucifixion, which is the most horrible and painful way to die, we may never truly understand the immensity of the wrath of God that he bore for us. He welcomes us to receive the benefits of forgiveness in our lives today and into an eternity by escaping the wrath of God on ourselves. If God acted in the way these positive thinkers describe forgiveness, he would have forgot about our sins, went away on some other business and left us to die, followed by an eternity of separation from Himself and eternal punishment for ourselves. Now that sounds horrible compared to the Bible’s description of God’s forgiveness? I think the Bible’s description of forgiveness and especially the forgiveness exemplified in Christ is far superior to anything you will find in the world. They claim the purpose of us being here is to evolve our consciousness as spiritual beings. Although this sounds deeper than the shallow thinking of materialistic living, it still falls far short of finding truth. Where do they find the confirmation of this statement of our reason for existence. How can we humans, being the thing made, truly understand the reason for existing apart from the the Creator telling us. All our attempts at understanding the reason for our existence are going to amount to speculation. What could be better than God, our Creator explicitly telling us the purpose for our existence. And furthermore, he confirmed it over and over again through Scripture by performing miracles. However, what confirmation do these people on Oprah have? None of them have split the Red Sea, caused fire to come from heaven, raise the dead, resurrect from the dead, or heal leprous diseases. These are all examples of incredible miracles that confirmed the messages from God that we find in the Bible. They don’t give credit to God as the person who has all things under his control. They think that they have power to better the planet with their positive thinking, however this grossly overestimates the influence they have on the world around them and the control they have of the world events that are far beyond their control. However, Christians have the benefit of knowing there is an all powerful ruler of the universe who has power infinitely stronger than all our positive thoughts put together. He tells us where history is going. One day, Jesus, His Son will return, judge the earth and redeem those who believe in him. I would much rather put my faith in a God with this sort of power than having faith that the sum total of a bunch of positive thoughts have some positive effect that is yet to even be determined. Christians should be thankful that God has determined what will happen, it is good for us and it is under his ability to carry it out. God has been faithful in the past, he has been faithful for us today, and we can trust in his faithfulness to continue into the future. And we can also be thankful that he does not depend on our thoughts to carry them out. I would hope that no one takes this positive thinking seriously and that everyone seriously considers the message of the Bible. Christians have no business dabbling in this positive thinking. The Bible is sufficient to explain every rule of faith and practice. God provided all that we need in His Word and we should look no further. For non Christians, I hope that you can see the superiority of the Bible and if my notes here did not give you a glimpse of it’s superiority, I hope that you could spend some serious time evaluating it for yourself. Please feel free to send me any questions and open discussion in any way you like. I would love to hear form you. In reading through Wayne Grudem’s Systematic Theology, he made an observation about government and evil that I think is very important for people to recognize. One of the primary means God uses to restrain evil in the world is human government. Human laws and police forces and judicial systems provide a powerful deterrent to evil actions, and these are necessary, for there is much evil in the world that is irrational and that can only be restrained by force, because it will not be deterred by reason or education. First, we can be thankful that there is not more evil in the world than we currently have. R.C. Sproul had also commented on one of his sermons, that it is by the grace of God that we don’t have ten thousand guys with guns coming at us everyday. God does a work of restraining the conscience by writing his law on our hearts and by instituting government to restrain evil by force. I’ve heard over and over again in the world, the philosophy that we could solve social evils by educating people. If people were simply smarter, there would be a lot less evil in the world. While it’s true that true wisdom and knowledge will lead to good, this overlooks the fact that ultimately, evil is irrational, and no amount of reasoning will cure this fact. If someone wants to persist in doing evil, they are simply deluded into following the course of actions which carry out their evil desires. Although evil deeds may be well planned and thought out and using impressive displays of intelligence, are ultimately irrational and does not cooperate with rational and wise thinking. It is not education, which will remedy the situation, it is government and human force that will put a stop to it. While it is true that it often does not solve the irrational thinking, it provides a way to display the consequence of evil. When a person who steals is by force put in jail and forced to pay a fine, this is a real life judgment and consequence for the sin. Without such forceful measures, the person may benefit in their sin and their evil, irrational thinking will continue to entice them into further sin and perhaps more heinous sins. However when stopped by force, they are forced to pay consequence for their sin and if they are not totally hardened, there is the real possibility that they will in their hearts, turn from their sin. In this turning from sin, education is important to inform people of the right way to go and the right kind of thinking. Within our borders, the police are meant to be the local restraint against evil. In the greater world, armies of nations are meant to be the global restraint against evil. Everyone would agree that the defeat of the Nazi’s were a successful display of forceful restraint. Our current conflict in Iraq is a little more difficult to judge. However, we should be careful in our judgment and recognize the dreadful consequences of sin and evil. It certainly causes death and destruction, and when the evil is on a large scale, the death and destruction are also on a large scale. Although none of us are truly innocent under the law of God, there are men and women who are innocent of any crime under the law of man, who will loose their lives as a result of the display of force that accompanies large scale war. And it is appropriate that none of us like it. But we must also remember, the solution is never going to be education. Our hope would be equally irrational and misguided to place our hope in educational as the savior from social evils. We should take the time to be reminded of how evil, evil truly is. Our desire should be to turn to the one being in this universe who is the stable and perfect good. What was his solution to this problem? What is God’s remedy for evil? God sent his Son Jesus Christ to ultimately conquer evil once and for all. While he was being crucified and experiencing the consequence of our sins, onlookers didn’t think that he had obtained victory. However, later, he rose from the dead, displaying his power and victory over sin. He has ultimately overcome evil for all and making this victory commonly available to all who would believe and ultimately be saved from both the consequences of evil in this world and eternity. During the Christmas season downtown San Jose has their Christmas in the Park. Jenn and I didn’t always go every year, but now that Matthew is at an age that he can enjoy it, we go every year. Last year he didn’t really care for the snow blowing machine, he way mainly trying to figure out how to get into the carnival rides. This time the snow blowing machine was his favorite. The snow comes from a machine that’s decoratively hidden between 2 flat wood animals (horses if I remember correctly), mounted on a park light pole. 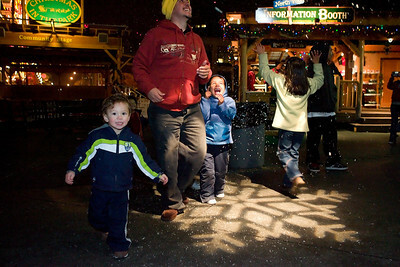 It projects a rotating snowflake onto the ground and the snow blows out periodically. The kids will often be coincidentally walking by when the snow blows and instinctively come running and crowding the area as the snow falls. When Matthew was younger, I think the chaos of the older kids jumping around him and overtaking him was a little too scary for him to enjoy it. Now, he seems to do much better. We also took a few photos preparing them for the night. 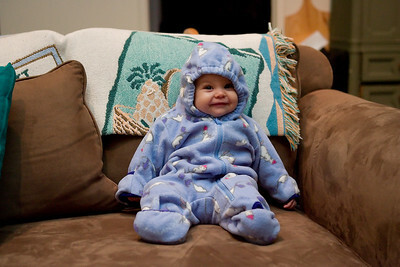 It was really funny to see Claire in the same outfit that Matthew once wore not too long ago. Well, it’s been months since we’ve been in Alabama and visited this pumpkin patch, but heck, it was fun and I still like looking at the picture. The pumpkin patch was actually a little overpriced considering we paid around $7 bucks each and only Matthew and I did anything there. Jenn sat around with Claire. Of course, Matthew really loved it. 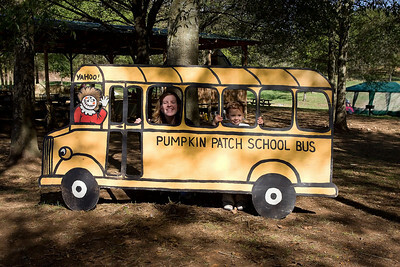 There were tricycles to ride, animals to see, kids to play with, a scary tractor ride, a pumpkin patch to pick a pumpkin, a pool of corn to dive into, a corn maze to get lost, and a school bus to look silly. Although we complain about the price, we don’t complain about the good memories. It’s a reality of life that each one of us goes from young and energetic to old and dying. From a biblical perspective, we are never truly living until we are born again through Jesus Christ. But even though our spirits can be reborn and our bodies can be resurrected into glorified bodies, in the meantime, we are all experiencing the wages of sin on our bodies. None are immune to these effects, aging of our bodies that eventually leads to death. For those of us who have parents who are still alive, this means that we will have parents who are aging in our very midst. The trend today is for parents to go to nursing homes and be cared for by strangers. In this technological society where children go off to work in cities or far away places, the children are not even living in the same vicinity of the parents and sometimes the parents don’t want to move closer to their children. So what is the proper way for children to care for their aging parents? God thinks honor of father and mother is so critically important that he instituted severe punishment for those children that dishonor their father and mother. So what guidance does the Bible give for children who have aging parents? Should they simply pay for a nursing home, rearrange their life to care for the parents? Should it be seen as a burden, or a blessing? These are topics of utmost importance. Dr. Russell Moore of the Southern Baptist Seminary discuss this issue on the Albert Mohler radio program. I recommend everyone to listen to this show. Whether you are an aging parent, or a child of an aging parent, this radio show is definitely important for you to listen to.